A few short years ago our dear friend (and dedicated Board Member), Leslie Gotfrit, dreamed up a fundraising initiative that has since become a favourite with musicians and artists alike. 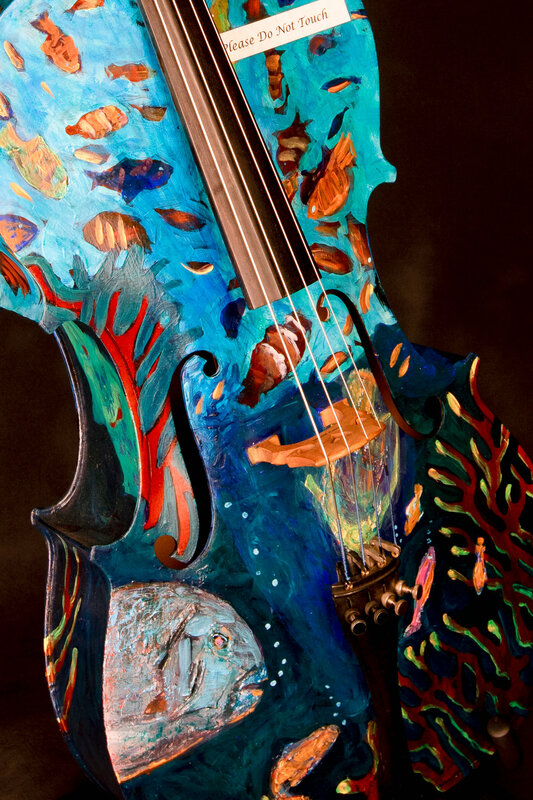 Old, unplayable violins are donated by violin shops in Calgary and are given new life by local artists who transform them into beautiful pieces of art. These amazing Art Fiddles are displayed at various events in and around Calgary and are auctioned off each spring at the Calgary Fiddlers annual Sweet on Fiddlin' show. All funds raised from this initiative go towards developing youth through music. Click here to see ‘EMERGING YOUNG ARTIST’ Art Fiddles! Inspiration for this piece: I wanted to combine my most favorite things together. Animals, Art and Music. I’m always looking to expand my horizons, so when given the opportunity to paint a violin, I couldn’t resist. Artist Bio: I was born in Edmonton, AB and have always loved to create art of every kind. In 1999 I created my business, “Art On Everything”. As an artist I have created many distinctive works of art. My focus lays primarily upon nature-based artwork as the detail required is my chosen style. My work is applied to a wide variety of mediums including canvas, stones, wood and more. Inspiration for this piece: I fell in love with this little violin as soon as it landed in my hands. Charmed by its tiny size and sweet little sound, I wanted to create a unique and interactive fiddle (and playable!) that would encourage young musicians to play it on different levels. What better way to get a child to practice by encouraging play with the instrument itself! Fiddle Bricks is covered in a base layer of red Lego and comes with a box filled with Lego Bricks that can be attached to the violin, removed, and then attached again however you want to! I was also inspired to create this piece having discovered my own deep connection to the violin. At age 40, I picked one up for the first time, drew the bow across the strings, and felt intense grief of not having this instrument in my life sooner, mixed with the immense joy of finally discovering it. I acquired my own, started lessons with a young teacher, and look forward to continuing to learn and play with my heart and soul! As an artist working almost exclusively with natural materials, I was a bit perplexed when this little fiddle asked me to cover it beautifully in Lego. I resisted for quite some time until I couldn’t deny its request any longer! My wish is for Fiddle Bricks to find its way into the hands of a young child who will be excited to practice and play and share beautiful music and fun with friends and family! Artist Bio: Janey is an Artist, Maker, Outdoor Experiential Educator and Guide, Community Facilitator and Mother on a path to remembering how to be human through the (re)learning of ancestral skills. She is inspired to work with materials from the earth, including salmon skin leather, cedar bark and wood, buckskin, stinging nettle, elderberry, blackberry vines, and birch bark to name a few. She is truly passionate about helping people to connect with nature, culture and community and firmly believes that creativity is essential to living a full and joyous existence. Making things with her own hands and spending time in the mountains occupies her thoughts and life on a regular basis. She is currently working in the Film Industry as an Ancient Technology Specialist and Advisor, building specialized earth-based props and is launching a line of handmade products and ancient technology workshops. Inspiration for this piece: I am a fan of opera and have been planning a series of sculptures celebrating famous characters in well-known operas. The shape of the violin inspired me to make a female figure and Madam Butterfly popped into my mind. Several chin rests created her hair, and the pegs and peg box became her hair ornaments. Red lips and rosy cheeks give her a coquettish air. All she needs is to burst into song…. ‘un bel di’ indeed! Artist Bio: I was born in Colombia and came to Canada in 1969. I have a Bachelor of Fine Arts, Master in Fine Arts, and PhD in Interdisciplinary Studies from the University of Calgary. My work is represented in collections worldwide and has been exhibited in Canada, England, Colombia, Spain, and Chile. My work is represented by Masters Gallery Ltd., Calgary. Time to think. Freedom. Love. I have been surrounded by art and creativity all my life. Some of the influences started early when as a child we were living across the street from a well-known artist in Winnipeg, Bruce Head. My family all seemed to be creative, which just helped fuel the desire and the creativity. At an exhibition, someone came by one day and sneered at me that I had no “formal training”. But my experimentation and appetite to learn have brought me further than I ever thought possible. I’m always looking to try something new, or figuring out a new touch that will add to the composition. I don’t have formal training, but I am having a lifetime of inspiration. My inspiration for this Fiddle stems from that last project I did with a Cello. I wanted to have the same feel of colour and movement in the piece. A sensation of meandering music. Her name Gretta resonates with me according to some of the music I listen to while painting. Included with the fiddle is a small black wooden piece I created as a hanging mechanism for Gretta so she can be displayed on a wall. My inspiration for the piece was the beautiful long winter we’ve had. I love the elegance of the bare trees against the snow, but I want them green already!! Gerardo has always been attracted to nature. As a child he loved to study flowers, leaves, seeds, landscapes, and anything else that caught his eye during frequent hikes in the diverse Mexican countryside, always imagining what he could create with the objects he found. A self-taught furniture maker, carver, and painter he learned through self-exploration how to do this difficult work with his hands. After earning a degree in textile engineering, Gerardo spent a year in Europe developing his art. After moving to Canada, Gerardo continued to develop as an artist, experimenting with different media, his work evolving into a unique combination of painting and carving. By using wood as his canvas, Gerardo’s art focuses on using the natural beauty of this material and bringing the hues, grains, and textures into balance in the whole composition in a way that is unexpected. Light is the final component when appreciating a piece of Gerardo´s art, completing the image by showing the detail of the carving portion of the painting, and letting the spectator experience and immerse himself into the realm of the work. I had recently seen some Underwater Dive Photos from a friends collection which were so beautiful with color and movement. Absolutely gorgeous photos of some of the life in our seas. My idea surfaced quickly - Under the “C”, where I could paint a scene from a beautiful coral reef. This just connected so well with Cello music. The sound of the Cello seemed to harmonize so well with the Shapes, Shadows. Movement and Beauty in our Life Under the Sea. 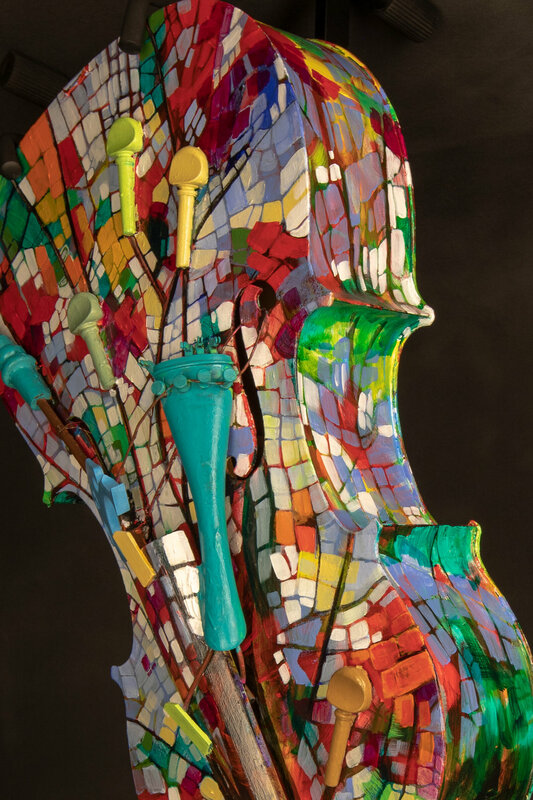 In this painted Cello, I used Acrylic Mixed Media. Starting with Molding paste I sculpted some of the larger forms togive the composition a bit more 3-D effect and some texture on the fish. Once that was dry I, I began layering in some of my base colours and sanding ONLY some areas of the Cello. I wanted to retain some of the original Wood finish on the Cello which worked so well with my design. This you will see in the Coral shapes surrounding the bottom and also on the back with a wave of original wood and some hidden Base Cleffs. Tiny bubbles also rise up to the scroll of the Cello. Janet B. Armstrong (AFCA, SCA), was born and grew up in Calgary, Alberta. She resides in the Cochrane area with her husband of 35 years, with whom she raised three children. Her formal education includes studies at the Alberta College of Art, Burlington Art Centre, and University of Calgary. Frequent participation in artists' advanced workshops helps her to continually hone her skills. Her passion for the Arts continues through her studio and plein air painting, fund-raising projects, and her art gallery business in the heart of Cochrane, Alberta. Janet has created paintings and murals for numerous corporate and themed events, and various private commissions. Her paintings have appeared on the covers of local magazines, and in collections throughout Canada, and in Europe, the UK, and Thailand. One painting, Morning at Ground Zero 2005, became part of an on-going art exhibition touring throughout Europe and the US, and onward to Japan. Janet began her career at Gulf Oil in Calgary, where she worked as an artist for seven years. The desire to blaze her own trail tempted her away from the corporate scene. As an independent contractor she has been engaged by the Calgary Public Library, the Calgary Zoo, the Calgary Board of Education, Eastslope Studios, Silvermoon Productions, Studio Y Creations, Anne Murphy Designed Events, and Udderly Art, among others. In addition, she taught painting classes to aspiring artists at various venues throughout Calgary and area for eight years. In 2012, Janet was honoured to be an Artist in Residence at the Banff Centre for the month of March. The following year she returned to the Centre to complete another residency at the Leighton Artist Colony. Janet is an Associate Member of the Federation of Canadian Artists (AFCA), and an Elected Member of the Society of Canadian Artists (SCA). Painting in her home studio or on location outdoors, Janet continues to create original artwork. She is also the creator and director of Just Imajan Art Gallery & Studio, which has won consecutive "Gold" awards for Best Art Gallery from the annual Best of Cochrane - Reader’s Choice Awards. Check out past Fiddle Art!